Now I'm no expert when it comes down to skin care, I actually have a lot to learn myself when it involves looking after my skin, but I get the gist on the basics. This post is purely just to share the products that I use that work best with my skin type at the moment. 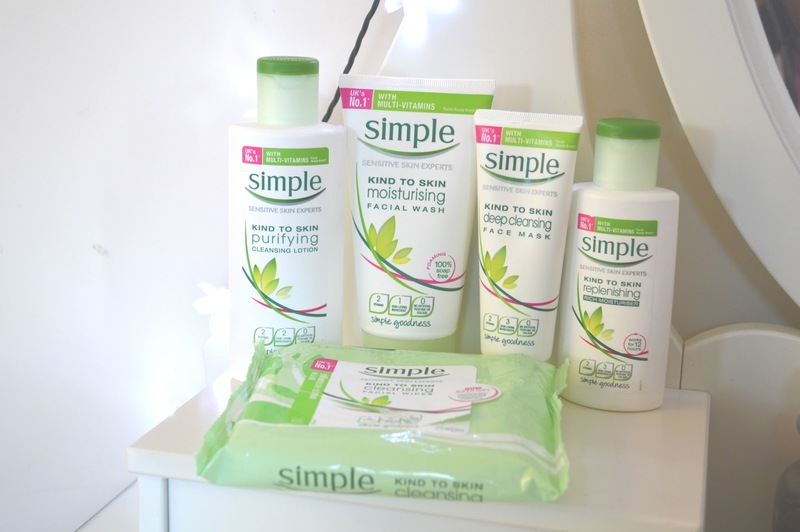 All these products are from the brand Simple, and they are a Drugstore favourite for a lot of people as they claim to be sensitive skincare experts. The products that I am currently using are the Moisturising Facial wash (£3.39), Purifying Cleansing Lotion (£3.29), Deep Cleansing Face Mask (£3.99) and the Cleansing Facial Wipes (£3.25 for a pack of 25). Moisturising Facial Wash - The face wash is to keep your skin thoroughly cleansed and nourished. It contains 2 vital vitamins that gives your skin the nourishment it needs; B5 which restores, softens and smoothes & Vitamin E which gives a hydrated feel. It also has 1 skin 'loving' nutrient; Bisabolol which helps to soothe and calm your skin. From what I have experienced with this product is that it helps my skin feel really clean and hydrating, it makes me feel like it gets rid of the last bits of dirt after I've removed any makeup but also gives me a refreshing wake me up in the morning. My skin always feels super smooth too, as smooth as a baby's bottom! 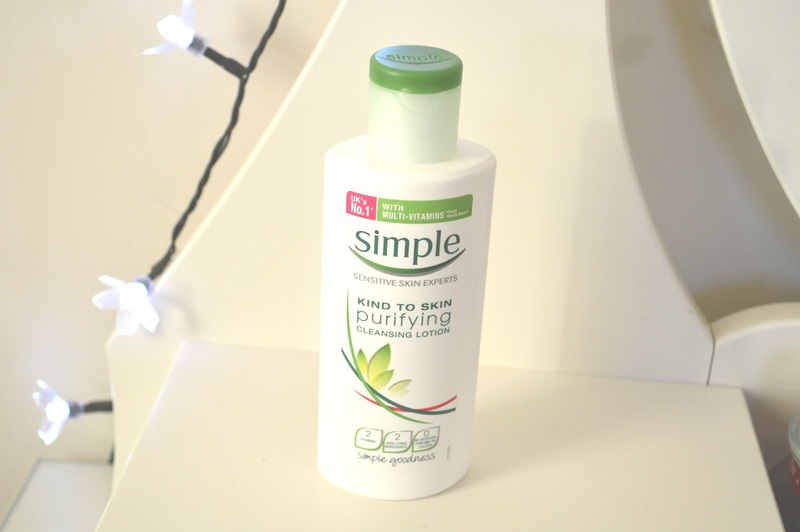 Purifying Cleansing Lotion - Simple's puryfying cleansing lotion is for gently cleansing dry skin types so it smooths and softens the surface. However this product only contains 1 vital vitamin which is B5 and 2 'loving' nutrients; Bisabolol and Allantoin which softens and protects your skin! Now, because I am being honest with all of you, my experience has been quiet a love hate relationship with this one. 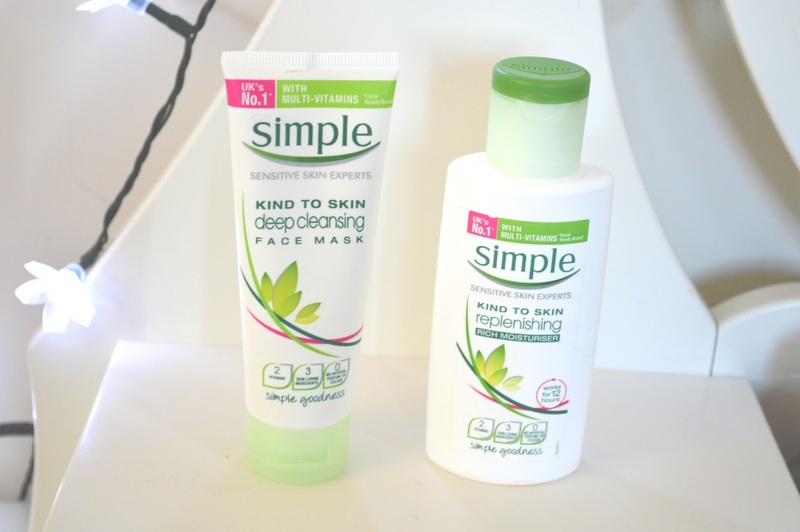 It does all the above, cleanses my skin and removes any makeup and dirt on my skin BUT it's been causing my skin to break out at times when It never normally does, even though it's specifically been made for sensitive skin. I'm unsure if I am supposed to carry on using it and eventually it will do some justice for my skin or if i'm actually allergic to an ingredient, who knows (I need some serious skincare advice and guidance as you can tell haha). Deep Cleansing Face Mask - The face mask is supposed to draw out the deep dirt from your pores and eliminate dead skin cells. It contains the 2 vital vitamins B5 and Vitamin E. So I have been told to believe that it also contains natural clay to detoxify and purify, & extracts of seaweed which helps to cleanse. From what I have experienced the only difference I have noticed is that my skins feels super hydrated, smooth and clean but I have noticed any difference with my blackheads. I do love a good face mask pamper night though. 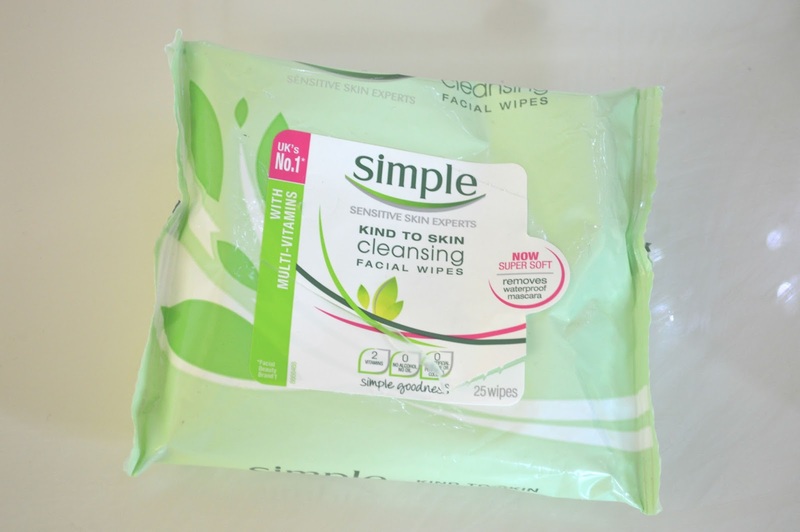 Cleansing Facial Wipes - The cleansing facial wipes are to give an extra boost of cleansing and vitamins but they also tone your skin at the same time. The contain B5 and just all round make you feel refreshed. I've been using these wipes for a very long time now and I really just like them to be honest. I only use them to take off my makeup but I really do adore them. First things first, I cleanse my face by using the cleansing lotion with a cotton pad to remove any dirt that my skin has collected during the night, you'll be surprised how quickly your face can pick up dirt, well with my skin anyway. I then go and splash my face with some water to help wake me up and I use the face wash on wet/damp skin and massage it into my face until it lathers up slightly and then I can go and rinse it off, and i'll then pat my face dry with a towel. 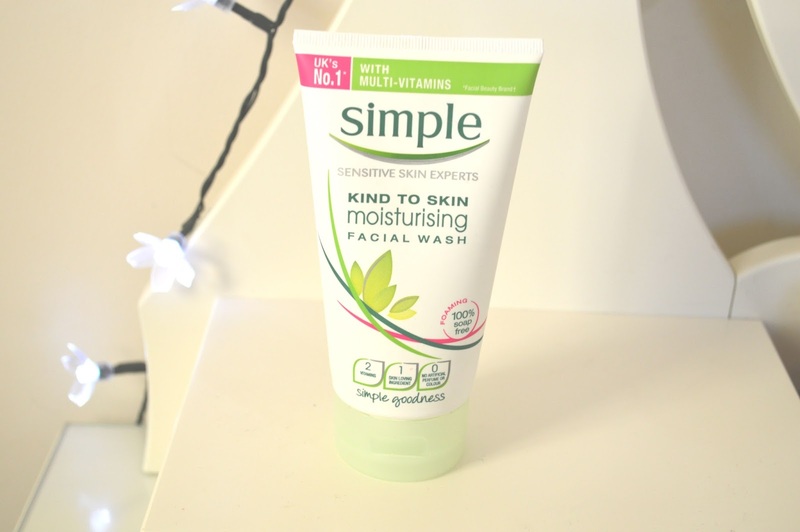 Lastly, after my face has been patted dry I will re-hydrate my face with the simple moisturiser which works wonders by the way! After I have completed my morning skincare routine I am ready to take on the day! This time I will remove my makeup in between 8 and 9pm using the cleansing facial wipes, I'll then use the cleansing lotion with a cotton pad again, to remove any leftover makeup that I've missed and any other dirt if there is any. Then it's time to use the facial wash to make me feel a little more refreshed (is it just me at this stage that feels like I've accomplished loads by simply just removing my makeup? I guess I just really like that clean feeling afterwards). Once or twice a week i'll use the face mask to give my skin a deeper cleanse and give my skin a little more TLC as I tend to get really dry patches on my face, i'll then just rise this off with water, pat dry with a towel and finish off by moisturising my face. Overall I really recommend these products as they do clean your skin, pours and removes any makeup or dirt etc. But I think i'll have to invest in their exfoliating facial scrub to see if that clears up my black heads and finally gives me that 'flawless, porcelain look' (I probably should have already done that though, oops). Whats your favourite drugstore skincare products to use?